Ricky Ponting has finally regained his golden touch after going through a recent slump in form. The Australian Skipper made merry on the opening day of the opening Test at the Sabina Park in Kingston making a superb 158. Australia as a resulted got to a commanding 301 for 4 at stumps. The 3-Test Match Series kicked off on a positive note for West Indies as Fidel Edwards struck twice with the new ball to see the back of the two Aussie openers. Both Katich and Jaques departed very early without making any significant contribution. Windies, however couldn’t continue to keep the Aussies under pressure and lost the plot. 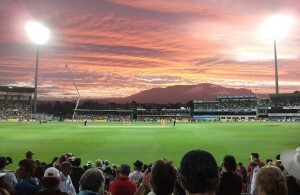 Ponting took over the game in company of Michael Hussey. By lunch, Australia were on the road to recovery at 87 for 2. The afternoon session finally produced the much needed breakthrough for the home side which came from debutant off spinner Amit Jaggernauth. Michael Hussey was forced to edge one which was brilliantly caught by Bravo giving Jaggernauth his first scalp. Hussey had by then made a not-so-fluent 56 after battling out for 146 balls and striking 6 fours. His partnership with the Skipper was worth 137 which lifted the score to 174 for 3. Australia only consolidated further in the remaining part of the day with Ponting going strongly and getting good support from Brad Hodge. Another solid partnership followed leaving the Windies to play the waiting game. It was only towards the fag end of the day’s play that the bowlers finally got a reprieve as Ponting got brilliantly caught at mid wicket by a diving Parchment off Bravo’s bowling. Ponting had scored 158 in 224 balls with 16 fours and a six. It was his 35th century that took him past Lara and Gavaskar and is now just four behind Tendulkar’s 39 centuries. Ponting will have to wait to get to the 10k club as he still got another 66 runs to get there. Australia finished the day at 301 for 4 in 87 overs with Brad Hodge on 53 (from 105 balls with 6 fours) along with night watchman Mitchell Johnson (1).